Here is a great tool for runners. The Jogging Planner creates jogging routes of any length from a given starting point using Google Maps walking directions. To create a route just set the distance you wish to run and then click on your starting point on the map. 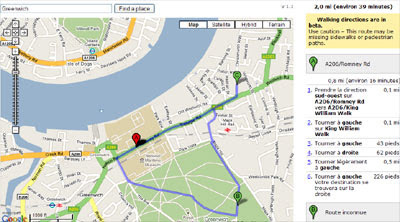 A jogging route will then be displayed on the map with the directions given in the map sidebar. If you don't like the look of the route just click on the 'find another route' button and another route of the same distance and from the same starting point will be generated. Each route comes with its own unique URL so you can bookmark the route to save it for later or share it with friends. Another good site to do your own mapping of routes is www.sportdistancecalculator.com, which has an altitude feature.